An internationally-renowned Boston wine tasting event - the Boston Wine Festival at the Boston Harbor Hotel - gets the New Year off to a great start and puts Boston on the map as one of the best American city for wine lovers. 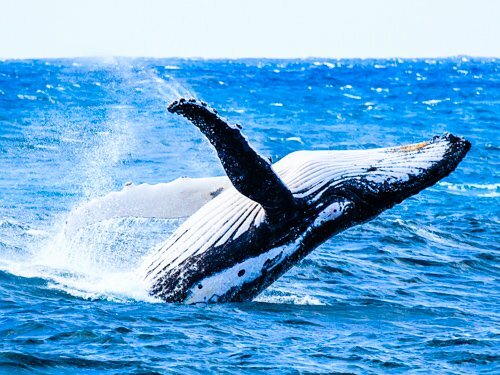 But as wine enthusiasts know, this Boston wine tasting festival is just the beginning of our city's love affair with wine - especially wine tastings, sampling food pairings, and exploring new vintages. Thanks to our large number of wine bars, restaurants specializing in wine-food pairings, and even our own Boston Wine School, we get plenty of opportunities to savor the top vintages from around the world - and if you're visiting Boston, you can too. 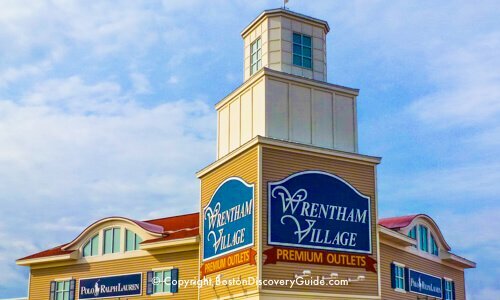 If you're visiting Boston, here's an overview of what you'll find, and why you'll enjoy these special wine-tasting events - truly on any "Best of Boston" list! Three decades ago, Chef Daniel Bruce of Meritage Restaurant launched the Boston Wine Festival, now the longest-running and most famous food and wine event in the United States. What is it about? For 3 months starting in early January, Chef Bruce pairs some of the world's finest wines with his innovative cooking overlooking Boston's waterfront at his restaurant in located in the luxurious Boston Harbor Hotel overlooking Boston's waterfront. Chef Bruce, whose wine knowledge is exceptional even among Boston oenophiles, gathers bottles from the best boutique wineries around the world for events such as the Battle of the Cabernets, Super Tuscans, and Rising Pinots, as well as nightly dinners profiling the best from particular wineries or labels. Each dinner and dish is unique to the wine, and each evening focuses on a type of wine, the best vintages of a particular winery or even a special event - the romantic Valentine's Dinner Dance and relaxing Valentine's Brunch, a Jazz Brunch, and the perennial favorite, Meritage Madness. Most dinners are limited to only 78 lucky guests - and they book up fast! If you love excellent wine paired with superb food, this is a must-not-miss event. Dates: Early January through late March or early April with 3 or 4 dinners and brunches each week; check the Boston Event Calendar for January for exact dates. We'd like to point you toward some great local wine tasting tours - but in Boston, brewery tours and pub crawls rule. In fact, Boston has always been a beer town. Maybe it's because the city's original Puritan settlers drank beer instead of water. Someday we may be able to suggest wine tours - but for now, enjoy the brew! Despite its lack of wine tours, Boston offers a wealth of wine bars and other places where you can sample excellent and interesting vintages from wineries and vineyards from around the world. Pair with food, and you have the makings of a very fine evening. haley.henry wine bar (45 Province St, Downtown Crossing; 617-208-6000) - Charming casual spot featuring a revolving selection of small batch natural wines (and a few beer selections), tinned seafood, civiche, crudo, charcuterie, and cheese. 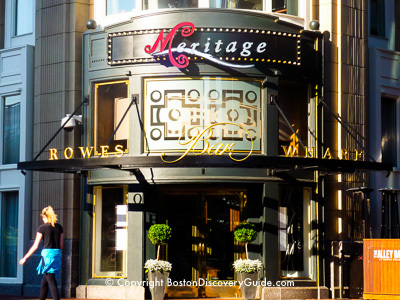 Meritage (Boston Harbor Hotel, Downtown Boston Waterfront; 1-800-660-9463) - Make dinner reservations and enjoy Chef Bruce's superb wine and food pairings at any time throughout the year. Jaho (665 Washington Street, Theatre District/Chinatown; 857-233-4094) - Coffee bar by day, wine bar by night ... this sleek but comfortable space beckons you to stop by for a drink at any time during the day and night. Barcelona Wine Bar (525 Tremont St, South End; 617-266-2600) - Extensive selection of Spanish and South American wines, mostly from small producers - at least 40 by the glass. Plus tapas, cheese, charcuterie, and larger dishes to share, including several paellas. Troquet (140 Boylston, Theatre District; 617-695-9463) - Fabulous French bistro. Owner Chris Campbell directs the wine pairings, and Chef Scott Hebert prepares the delicious food. Many consider this Boston's best best wine-pairings. Come here to enjoy some of the top vintages in the city, with many available by the glass. Les Zygomates Wine Bar and Bistro (129 South Street, Downtown; 617-542-5108) - Fine wine and exquisite food, plus live jazz or blues every evening. Wine tastings paired with food on Tuesday nights at 7 pm. Call to find out what's on offer, and make reservations. Navy Yard Bistro & Wine Bar (Charlestown Navy Yard, 6th Street, Charlestown; 617-242-0036) - Nice wine selections, small menu but delicious food - definitely in the "Boston Insider's Secret" category! Beacon Hill Bistro (25 Charles Street, Beacon Hill, Boston; 617-723-7575) - The talented chef pairs the perfect vintages with his multi-course French and American dinners. Or just stop by the Fireplace Bar to enjoy a glass of your favorite. Stay in the hotel for the weekend! 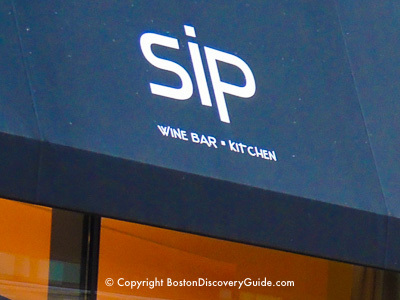 Sip Wine Bar (581 Washington Street, Theatre District; 617-956-0888) - Choose from 4 different pour sizes ranging from a sip to a bottle, and pair your choices with the menu's tempting small plates, sushi, tapas, and dinner entrees. Check out other Theatre District restaurants offering food and wine pairings. Bin 26 Enoteca (26 Charles Street, Beacon Hill; 617-723-5939) - Come to this cozy Beacon Hill spot for the extensive wine list, and pair it with your choices from the innovative menu. Renowned wine writer/critic Jonathon Alsop founded the Boston Wine School, where he's been teaching about wine and food classes since 2000. Choose from a wide variety of wine tasting classes, with or without dinner. Most tasting classes and dinners let you sample 6+ different wines with the perfect food accompaniments. 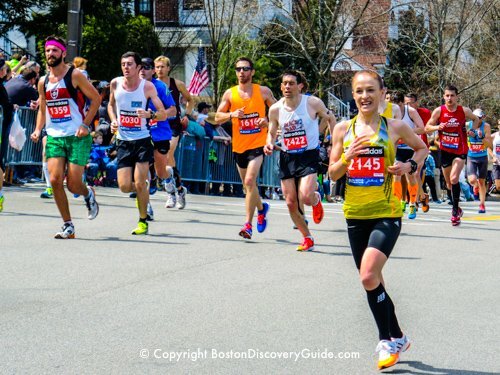 If you're visiting Boston, this could be your most memorable experience! Check the Boston Wine School website for a calendar of tastings and dinners.